If the augend (addition) or minuend (subtraction) is a whole number only, leave the numerator and denominator blank. If the augend/minuend is a mixed number, enter a positive integer for the whole number, the numerator, and denominator. If the augend/minuend is a fraction only, leave the whole number field blank. If the addend (addition) or subtrahend (subtraction) is a whole number only, leave the numerator and denominator blank. If the addend/subtrahend is a mixed number, enter a positive integer for the whole number, the numerator, and denominator. If the addend/subtrahend is a fraction only, leave the whole number field blank. This is the result of adding or subtracting the mixed numbers. After performing the selected operation, the adding and subtracting mixed numbers calculator will show its work and give a detailed explanation of each step it took to arrive at this result. 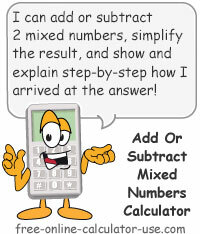 This calculator will add one mixed number to another, or subtract one mixed number from another -- regardless if the two mixed numbers have the same or different denominators -- and give the resulting fraction in simplest form. Plus, unlike some other online mixed number calculators, this calculator will show its work and give a detailed step-by-step explanation as to how it arrived at the result. Enter the whole number, numerator (top) and the denominator (bottom) of the 1st entry. Tap either the plus or minus option. Enter the whole number, numerator and denominator of the 2nd entry. Note that for Step #1 and Step #3 you can either enter a whole number only, a mixed number, or a fraction only. Click the "Add Subtract Mixed Numbers" button. This will display the result along with a dynamically generated tutorial. The top number for each factor that contains a fraction. If a factor is a whole number only, leave the numerator and denominator fields blank. The bottom number for each factor that contains a fraction. If a factor is a whole number only, leave the numerator and denominator fields blank. The process used by the Adding Subtracting Mixed Numbers Calculator to find the smallest number that the denominators of two or more fractions will all divide into evenly. This process is necessary for adding, subtracting, or comparing fractions with different denominators. How to add and subtract mixed numbers. The only difference between adding or subtracting mixed numbers and adding or subtraction fractions, is that before you begin to add or subtract you must first convert the mixed numbers to improper fractions. To convert a mixed number to an improper fraction, you first multiply the denominator of the fractional portion by the whole number and then add that product to the numerator. That result then becomes the numerator (top) of the improper fraction, while the denominator (bottom) remains unchanged. Once you have converted the mixed numbers to improper fractions, you simply add or subtract the fractions as usual. Convert the mixed number in the augend (2 2/3) into a fraction. To convert the mixed number, multiply the denominator (3) by the whole number (2) and then add the numerator (2). This gives you a top number of 8 (3 × 2 &plus; 2) while the bottom number (3) stays the same. Convert the mixed number in the addend (3 1/2) into a fraction. To convert the mixed number, multiply the denominator (2) by the whole number (3) and then add the numerator (1). This gives you a top number of 7 (2 × 3 &plus; 1) while the bottom number (2) stays the same. Since 8/3 and 7/2 have different denominators, you need to find the Least Common Multiple (LCM) of the denominators and then multiply the top and bottom of each fraction by the number of times the denominator goes into the LCM. According to my calculations, the LCM of the two denominators is 6. Therefore, since 3 goes into 6 a total of 2 times, you would multiply the top and bottom of the first fraction by 2. And since 2 goes into 6 a total of 3 times, you would multiply the top and bottom of the second fraction by 3. Now that the denominators are the same, you simply add the numerators (16 + 21) while keeping the denominator (6) the same -- giving you a result of 37/6. Since 37 and 6 have no common factors, the result cannot be reduced. Since the numerator is greater than the denominator, the fraction 37/6 is an improper fraction. To convert the improper fraction to a mixed number, you divide the numerator (37) by the denominator (6). Since 6 goes into 37 a total of 6 times, with a remainder of 1, the mixed number would be 6 1/6. To subtract one mixed number from the other, you repeat all of the same steps above, but instead of adding the numerators (top) in Step #4 you subtract the second numerator from the first while still keeping the denominators (bottom) the same.